Made of teak wood from Burma, air-dried by a natural process during eight years before its construction started. 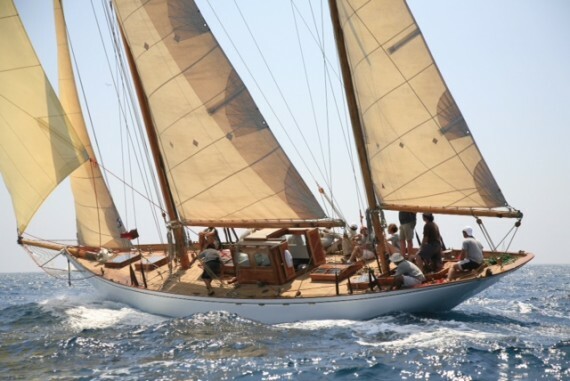 Its owner, Tom Blackwell, was an English former sailor of solitary nature and few friends. He never spoke about his past or his family and neither invited anybody on board. With its first owner the Islander flaunts the record of sailing three times around the world alone. He circumnavigated solitary and every three years came back to Humble (England), where he repaired, painted and conditioned the Islander for its next voyage. In one of its voyages the Islander docked at Durban’s port for its owner’s health problems. Tom didn’t want his family to inherit the Islander, therefore he had to sell it. The sell was negotiated on deck for 35.000$. With the money he was able to pay his operation. Some money also went to Caritas and another amount went for the Islander Room, where the Islander’s boom presides the saloon. Its new owner was J.Matews, a lawyer from Durban. He brought the Islander to New England (EEUU) to repair and modernize it. In 1981 Luís Garí found the Islander full of dust and abandoned at the Carabella’s shipyards at Poble Nou in Barcelona. In January of 1989 Luís Garí sold it to its current owner. Nowadays the Islander has its base at the RCN Barcelona. In 2004 the Islander was revised. Some ammunition from a Bross-Bess English rifle was found on its sternpost wood. (Cannon length: 9mm, calibre 15-19mm of 1957).